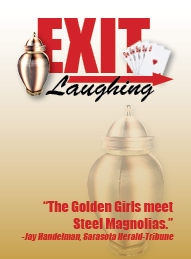 County Players Presents "Exit Laughing"
When the biggest highlight in your life for the past 30 years has been your weekly bridge night with the girls, what do you do when one of your foursome inconveniently dies? If youre Connie, Leona and Millie, three southern ladies from Birmingham, you do the most daring thing youve ever done. You borrow the ashes from the funeral home for one last card game, and the wildest, most exciting night of your lives involves a police raid, a stripper and a whole new way of looking at all the fun you can have when youre truly living. Winner of the AACT NewPlayFest 2014.